comprised the present Anambra State and Enugu State including the Abakaliki part of Ebonyi State, with Enugu as its capital. During further states creation in August 1991, Enugu State with Abakaliki was excised , leaving Anambra State as presently constituted, with Awka as its capital. The state derives its name from the Anambra River, the largest, most southerly, leftbank tributary of the River Niger. With a total land area of 4,416 sq. km, Anambra State, situated on a generally low elevation on the eastern side of the River Niger, shares boundaries with Kogi, Enugu, Imo, Abia, Rivers, Delta and Edo states. The creation of the present Anambra State resulted mainly from the desire to spread the gains of economic development and arrest the national problem of northsouth, geopolitical dichotomy evi dent in the former Anambra State. 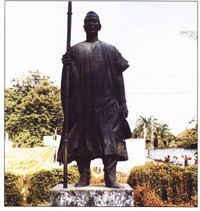 There was the agitation that the indigenes of the present Anambra State, because of their highly developed manpow er, dominated the state public services; while on the other hand, there was some measure of concentra tion of infrastructural base and government industri al development in the region that now is Enugu State. Administratively, the state consists of twentyone local government areas as listed in Table 4.1 and the state capital is Awka, renowned for its craft industries, mainly blacksmithing and wood carving. There are three senatorial districts in the state, namely: (a) Anambra North, comprising Awka North and South, Njikoka, Dunukofia, Anaocha, and Idemili North and South Local Government Areas (LGAs); (b) Anambra Central, made up of Onitsha North and South, Ogbaru, Oyi, Ayamelum, and Anambra East and West LGAs; and (c) Anambra South consisting of Orumba North and South, Aguata, lhiala, Ekwusigo, and Nnewi North and South LGAs.